Sony unveils next-generation Xperia mini smartphones with HD video | What Hi-Fi? Sony claims its two new Xperia mini smartphones are the world's smallest Android phones with HD recording. The Xperia mini pro (above) Xperia mini (below) feature HD video recording, a 'reality display' with mobile Bravia engine, access to more than 150,000 apps on Android Market and the ability to place up to 16 apps on the homescreen. They're powered by a 1GHz Qualcomm Snapdragon processor, run the latest Gingerbread 2.3 software and have a 3in touchscreen display. Social networking functionality includes the new Facebook Inside Xperia feature, which provides Facebook access from the phone's picture gallery, music player, phonebook and calendar. 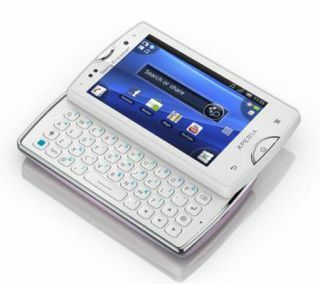 The Xperia mini pro has a slide-out keyboard for fast message typing, and is pre-loaded with Office Suite and McAfee antivirus software. Colour options are black, white, dark pink and blue for the Xperia mini, and black, white, pink and turquoise for the mini Pro. Both have a 5MP VGA camera, LED flash, WebKit web browser, Sony Ericsson music player, A2DP Bluetooth, Twitter integration and 3D gaming compatibility. They'll be available in the UK during the third quarter of this year.